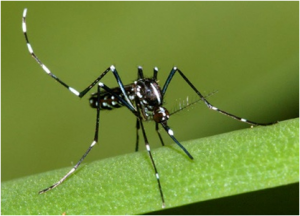 The Asian tiger mosquito, Aedes albopictus, is characterized by its black and white striped legs, white racing stripe, and small black and white body. It is native to the tropical and subtropical areas of Southeast Asia; however, in the last couple decades this species has invaded many countries through the used tire trade. This mosquito was first found in Virginia in 1991. Although this mosquito has not proven to be responsible for spreading West Nile virus in our region, it is capable of transmitting diseases such as Zika virus, dengue, and chikungunya. The Asian tiger mosquito has become a significant pest in communities because it closely associates with humans and typically flies and feeds during the daytime. They lay eggs only in containers of water, not in ponds, puddles, ditches or swamps. If Asian tiger mosquitoes are biting you, they likely hatched on or near your property. Watch a video of common Asian tiger mosquito breeding sites.